Joel Ohman lives in Tampa, FL with his wife Angela and their three kids. His writing companion is Caesar, a slightly overweight Bull Mastiff who loves to eat the tops off of strawberries. 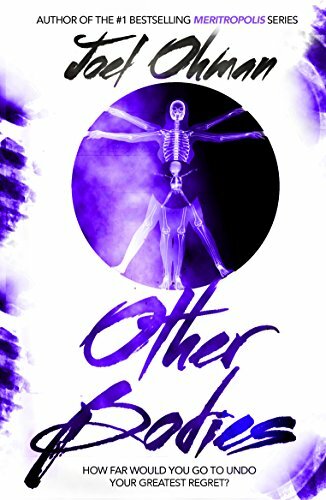 Joel is the author of the #1 bestselling Meritropolis series--"The Hunger Games meets The Village with a young Jack Reacher as a protagonist" and the new YA release, Other Bodies. " This book deals with that very controversial topic of abortion. I am pro-life, so I chose this book to see what the author had to say and how the author was using his voice to address a difficult subject. I also thought my son might enjoy reading it, since he is more into the the dystopian, sci-fi, type books than I am. It was funny, after starting the book, he said, "Mom, do you know what this book is about?" I said, "Yes! Abortion. Why?" He said, "I thought the book was about some robots or everybody having two bodies". So, he didn't know if he really wanted to read it. However, after getting to the part about the virtual reality robots, he said he thought he would read some more, that it wasn't all that bad. I think the author did a pretty good job of writing a book for teens or young adults, who enjoy that style. I finished it, but I wasn't really that into the genre. I also felt like the ending was kind of abrupt. Usually, I read Christian novels, however, the author did not really address this book from a Christian standpoint. I felt it was lacking in offering hope, forgiveness, and the fact that Christ cares about the person who had the abortion, as well as the baby that was aborted. It also kind of seemed like the girl in the book was older than 16. She gets a job at an abortion clinic and lives alone, and seems like she has been living alone for several years sine the passing of her grandfather. Although, I have not had an abortion myself, I felt the author did a good job of projecting emotions and feelings of those who have possibly felt compelled to take that path due to circumstances they felt were beyond their control. Of course, unless you have actually been in that situation I am sure it is difficult to really know what it would be like. There were also some pretty sad and disturbing aspects in regards to abortion procedures discussed that are not for the faint at heart. Overall, although the topic was well addressed, it was somewhat sad and I had hoped the author would have at least offered Hattie some hope for the future and peace through Jesus. However, I would recommend this book! I was blessed with a copy of this book courtesy of FlyBy Promotions and the Author. All opinions are my own.